Guest Post From My Mum! - Oh it’s Grand Being a Grandma! Today's guest post is by none other than my Mum, Jane. Mum blogs at The Competition Grapevine and writes a monthly publication under the same name which is dedicated to inspring the world to enter (and win) competitions. Not being the sort of person who automatically likes babies just because they are babies, I have been rather puzzled over the years when intelligent, rational, middle aged friends, both female and male, turned into misty-eyed dreamers at the mere mention of their grandchildren. Surely nothing could compare to having a child of your own? To holding your first baby in your arms and thinking, “We made that!” A generation down the line, wouldn’t a certain amount of remoteness come into play? 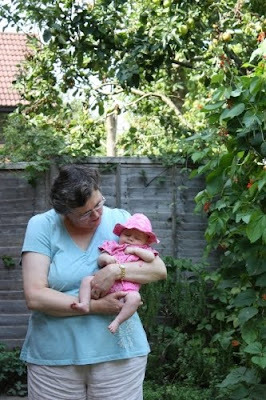 All that changed in June 2009 when our first grandchild Lara was born. I first held her just a few hours after she was born and fell in love at first sight. The feeling of “We made a child who was capable of producing that!” was unexpected and quite overwhelming. And as Lara has grown older, it has been wonderful to see how readily that love is returned. When she sees me, her face lights up and I know that the love is unconditional – it’s not because I feed her, clothe her or care for her. It’s simply because I’m there. Being a first time granny isn’t without its worries, the main one being how to provide the help and support that is needed without appearing to interfere. I hope that being ready and willing to help when asked without actually sticking one’s oar in uninvited is the right way to go about things (and I’m sure when Emma reads this, she will tell me if it isn’t). Discipline and routine may provide minefields further down the line. Emma and her sister only saw their grandparents once or twice a year because of where we lived, so it was very easy for them to accept that different houses had different rules, and that grandparents were put on Earth for no better reason than to spoil them. They soon understood that it was perfectly acceptable to have ice cream for breakfast at Grandma’s house and yet unacceptable to even consider asking for it at home. As Lara lives much nearer to us and we hope to see her more often than that, we won’t be able to break House Rules so freely and will have to make such treats into special occasion ones. But every grandparent loves to spoil their grandchildren, and I have a way of producing unexpected treats and goodies that is guaranteed not to cause any kind of conflict – I win them! As you may know from Emma’s previous blog posts, I am a comper, so winning things is a hobby and a way of life for me. I have always enjoyed winning prizes that I could give to the family, as a way of providing extra treats all through the year rather than just at Christmas and birthdays, and now there is a whole world of baby and child related competitions for me to enter. Many of the parenting websites also welcome registrations from grandparents, and most of them run several new competitions each month. There is also a dedicated site for grandparents, Be Grand which often has competitions open only to grandparents. Toy shops and children’s wear shops, both on the high street and online, also run frequent competitions. Only a few days ago I was able to give Lara this striking new dress from Barnyard Kids which I won through a competition run on the Four Magpies blog. I know that most people reading this blog will be parents rather than grandparents. You may, yourselves, have parents who are beginning to show their age, to slow down and not be as active as they used to be. Or they may be close to retirement and looking for a not-too-costly hobby to fill the new leisure time they anticipate. Entering competitions could be just what they are looking for – and as a bonus, they might soon be winning treats for you and your children!